The first sound surround system to take advantage of Dolby's Atmos format is finally hitting shop shelves next month. 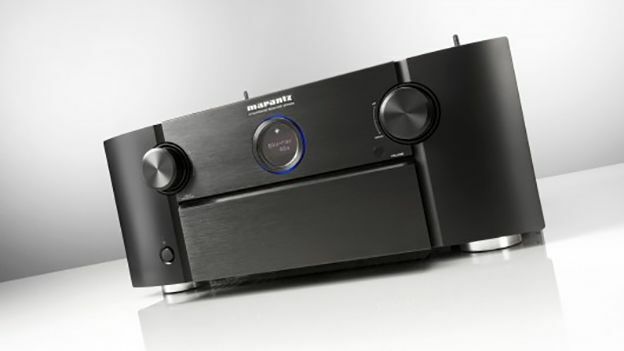 The Marantz SR7009 packs in a 9.2-channel configuration that is able to support a number of Atmos speaker layouts. According to Marantz, the supported layouts are 5.1.2, 5.1.4, 7.1.2, 7.1.4 and 9.1.2. If you're not a home cinema buff, you're unlikely to have ever come across the third number before. The third number in an Atmos system refers to overhead speakers. The first and second of course refer to the number of satellite speakers and the subwoofer. The addition of overhead speakers is the biggest change with home Atmos speakers. The main reason for their inclusion is that Atmos works differently to traditional 5.1 and 7.1 sound surround systems. “Thinking about sound in this way eliminates many of the limitations of channel-based audio,” Crocket continued. "In a channel-based system, filmmakers have to think about the speaker setup: Should this sound come from the left rear surrounds or the left side surrounds? According to Marantz's announcement of the system, those wishing to use the 7.1.4 and 9.1.2 set ups (a total of 11 speakers) will require an additional power amplifier to do so. For those who don't want downward facing speakers, Dolby has confirmed that it is working with speaker partners to launch ground-mounted upwards speakers. The SR7009 will launch in the US next month for $1,999 (£1,205). There's no word on a UK launch date, but we'll keep our ears to the ground. As for movies that are capable of taking advantage of Atmos, they'll start arriving in autumn.